BMRCL Careers making opportunity for engineers and Diploma Holders under various engineering stream. BMRCL Recruitment 2019 for 174 various vacant job profiles. ITI, Diploma Holder and Degree holder can apply for these various job profiles under this Bangalore Metro Railway Recruitment 2019.So those who are wishing to apply these Metro jobs in Bangalore city have to apply online through the official website only. Metro jobs Application are invited from qualified Indian Residents for the following posts (Total 174 Posts) in the Operation & Maintenance Wing of BMRCL. Please see detailed instructions for applying on- line for these Government jobs for engineers and other job profiles below in this article. "Instructions for filling up the Application form is given inside the official PDF file also. We shared the official PDF file link under IMPORTANT LINK section at the last of this article. Metro Job applications will be received on-line only. No paper applications or applications through post / email etc. will be accepted. Read the complete article carefully before applying for this BMRCL Recruitment 2019. Number of Vacancies: 134 Posts. Pay Band: Rs.10,170 -Rs.18,500 Per Month. Number of Vacancies: 21 Posts. Pay Band: Rs.14,000 -Rs.29,950 Per Month. Pay Band: Rs.16,000 -Rs.30,770 Per Month. Those who have 2 years ITI in any one of the following Engineering Trade: “Electrician / Instrument Mechanic / Mechanic Radio and TV / Electronics Mechanics / Wireman / Fitter / Mechanic Computer Hardware / Mechanic – Industrial Electronics / Information Technology & Electronics System Maintenance / Mech. Communication Equipment Maintenance, Masonry, Carpentry, Building, Refrigeration and AC Mechanics Mechanic Mechatronics or equivalent qualification. Applicants having 3 years Engineering Diploma in one of the following stream: “Civil/Electrical & Electronics Engineering / Electronics & Communication Engineering / Electronics Instrumentation & Control / Mechanical /Telecommunication / Computer Science and Engineering / Computer networking / Applied Electronics/ Digital Electronics/ Power Electronics/ Industrial Control” or equivalent qualification can apply. Candidates having BE/B.Tech degree in “Civil/Electrical & Electronics Engineering / Electronics and Communication Engineering/ Instrumentation & Control Engineering / Mechanical / Telecommunication / Applied Electronics & Instrumentation/ Computer Science” can apply for this BMRCL Recruitment 2019. Age Bond: Applicants must have the age less than 33 years for applying this BMRC Recruitment 2019. 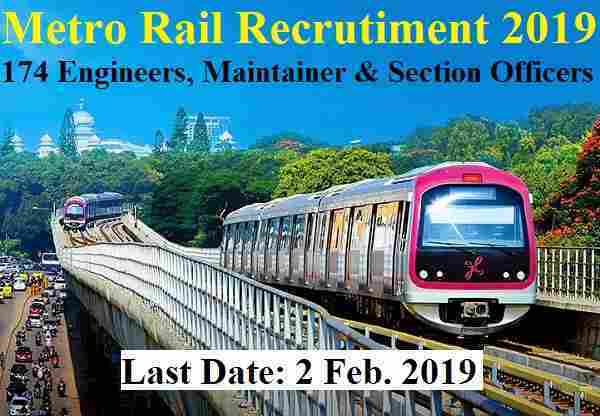 Those who lies in between this age criteria can apply for these Metro Rail Corporation recruitment 2019. Paying Method: You can pay the overhead examination fee structure through Online method using Net Banking, Debit Card, Credit card as well as with SBI Bank Challan. 3RD Jan. 2018 is the Start Date to apply.